Also available in 14K Yellow Gold, 14K White Gold, 18K Gold or Platinum by request. 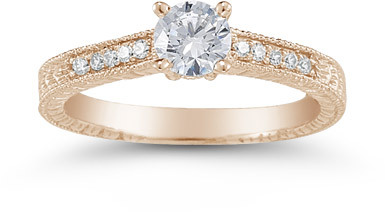 Apples of Gold uses only the finest gold and diamonds to make this ring your ideal lifetime choice! Apples of Gold Jewelry guarantees the 14K Rose Gold 0.33 Carat Vintage Floral Diamond Engagement Ring to be of high quality and an authentic engagement ring with real diamonds, as described above.